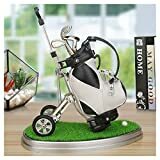 If you're searching for golf gift ideas for a colleague, friend or loved one our comprehensive round-up of gifts for golfers is sure to suggest something for even the most discerning recipient. Check out list below as we rundown our top gifts for golfers! 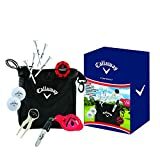 This beautifully put together golf gift set comes with a zippable nylon pouch that anyone would find incredibly handy. It has a fleece lining with smaller pockets inside to keep things organised and a plastic clip to attach pretty much anywhere. The denier nylon exterior provides excellent durability. The set also features a host of other goodies including; performance tees, a ball marker, putt align tool, divot repair tool and poker chip ball marker. The quality of this organiser is indisputable. The real leather exterior means lasting quality and provides a handy magnetic attachment for holding score cards, along with a holder for tees and a divot tool both included. It's relatively large which may put some off but the bag clip ensures you aren't left carrying it or trying to find a pocket it will fit into. The advantage of it's size though is that it can hold a full scorecard without folding. Why we like it: Overall an excellent gift that's sure to become a regular addition to any golfers kit. This novelty mini golf bag is a fun golf gift idea and a great addition for any golfers' home! The bag is incredibly well made and looks great on the included artificial turf base. It also comes with three aluminium golf club pens to complete the look; the driver has red ink, the putter has blue ink and the wedge has black ink (you can store your own pens too). The wheels rotate so it can be moved just like a real bag and the soft PU leather is available in a black & white or black & silver design. Why we like it: Functional and well-made, the mini golf cart bag would make a welcome addition to anyone's desk! The PuttOut Putt Trainer is a great gift for golfers and with repeated use can dramatically improve your score. This compact putting practice tool is designed to return good putts and reject bad ones. It utilises a parabolic curve to return the ball the same distance it would have gone past the hole if the shot had missed, providing excellent feedback to help refine your putting pressure. Made from high quality elastomer and translucent polycarbonate it also folds neatly to fit into your golf bag. If you're looking for a practical gift look no further! This all-in-one multitool combines six different functions into one compact and lightweight design. It features an ergonomically designed metal case with rubber non-slip hand grip and a belt clip to keep it handy at all times. 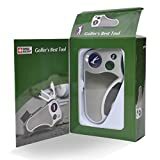 The swiss army knife design tucks away a ball marker, cleaning brush, stroke counter, cleat tightener, club groove cleaner, divot repair tool and even includes a bottle opener and screwdriver! The large surface would also be suitable for engraving to add an extra special touch.